With average growing conditions corn planted after June 1 to June 5 in northern and central Wisconsin and after June 10 to June 15 in southern Wisconsin, will probably not mature with reasonable grain yield and moisture content, even with very early hybrids. However, corn silage from shorter-season hybrids may still have acceptable quality when corn is planted until June 20. Corn planted after June 20 will likely contain little or no grain, and only stover (stems and leaves) will be produced. Table 1 lists alternate hybrid Relative Maturities for delayed planting dates for the standard Relative Maturity belts shown in Figure 1. Figure 1. Relative maturity zones (in days and Growing Degree Units – GDUs) for full-season corn hybrids planted before May15. Table 1. Relative maturity of adapted corn hybrids for different planting dates and relative maturity zones. 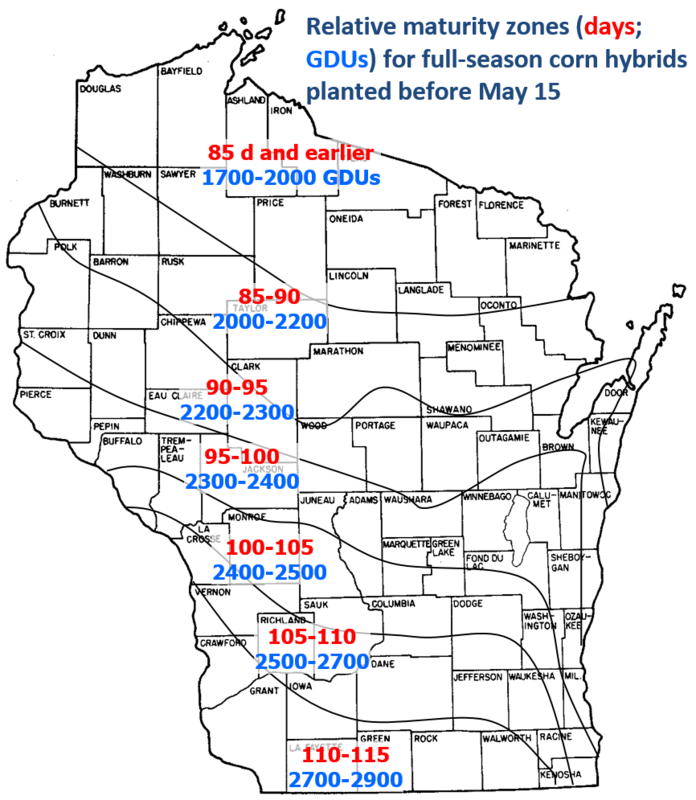 Derived from UWEX A3353 – Corn Replant/Late-Plant Decisions in Wisconsin. Kernels contain about 70% moisture. About one-half of mature kernel dry weight accumulated. Grain will unlikely achieve maximum yield potential unless stalk, ear and some lower leaves survive. Corn can be used for good quality silage, but entire plant must be allowed to dry to about 65% moisture. In early dent, kernels contain about 55% moisture; are 3 to 3.5 weeks from maturity; and about half of mature dry weight has accumulated. In late dent, kernel moisture is decreasing and yield is within 10 percent of final mature dry weight when kernels are past half milkline. Corn will make good silage when harvested at a whole plant moisture content of 65%. Can be harvested for grain after long field-drying period. Grain yields will be reduced and test weights low. If plant is only partially killed or the crop is close to physiological maturity before the freeze (kernel milk line half-way or closer to tip), yield loss will be only 5 to 20 percent, and test weight will be lower. Kernel moisture is 28 to 35% depending on hybrid. Killing freeze will not affect grain yield or quality. Dry-down rate of grain depends on hybrid and environment. For example, corn yield potential of a late planting declines at a faster rate than the yield potential loss of soybeans. After June 1, it may be advantageous to plant soybeans, instead of corn, if this fits your rotation. Sunflowers and buckwheat are other grain crops that can be planted very late. Forage sorghum, sorghum-sudan crosses or sudangrass can help boost forage supplies and be planted into July. You must consider prior herbicide and fertilizer applications, desired rotation, livestock feed requirements, and the possibility of erosion on slopes when you are choosing a crop to plant late. For more information on herbicide rotational restrictions, see UW Extension publication A3646 — Field crops pest management in Wisconsin.